#ColorYourMood with Freshlook & Air Optix Colors on July 10! Are you a contact lens wearer? Or maybe someone who's interested in trying it out? Do you have pretty bad eyesight like I do? Or perhaps, you just want the freedom to change your eye color into something else? Well, whatever your reason for wearing contact lenses, I bring good news to you! 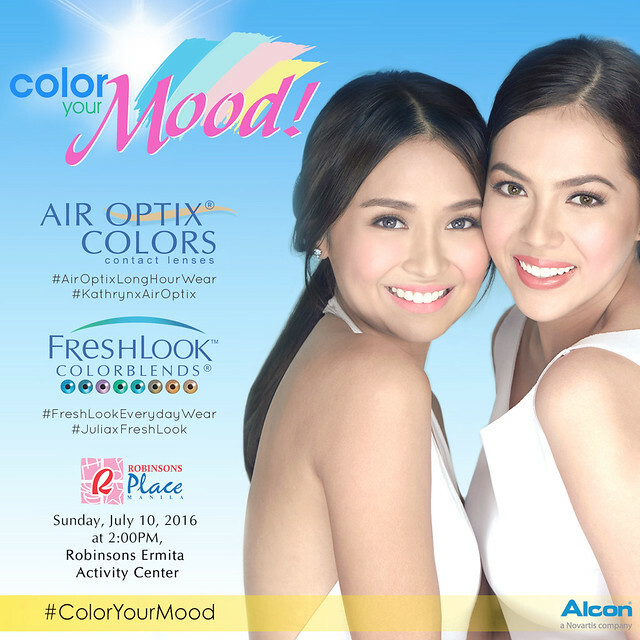 Alcon, a global leader in eye care, would like to invite YOU to witness the launch of Kathryn Bernardo and Julia Montes as ambassadors of AIR OPTIX ® Colors and FreshLook ® Colors brands of contact lenses. So save the date! This is all happening on July 10, 2016 (Sunday) 2PM onwards at the Robinsons Place Manila Activity Center. Freshlook and Air Optix Colors users can gain FREE access to the special event simply by showing an official receipt with a minimum purchase of 2 pairs of contact lenses dated July 4 to July 10, at the registration booth as early as 10AM on event day. The first 400 to register will get to have the privilege to partake in activities like free contact lens trials, photobooth, body art and have a photo op with Kathryn and Julia. Freshlook and Air Optix Colors will also be giving away gifts and prizes during the big event. So if you're a fan of the brand, and a fan of both of these talented ladies, then don't miss this! For more information, visit Freshlook Contact Lenses Philippines and Air Optix Colors Philippines on Facebook. You can also follow them on Instagram: @FreshlookPh and @AirOptixPh. It was the great experience of yours to visit there and test the freshlook air optix colors brand of contact lenses. Find the largest online store to buy Circle Contact Lenses at affordable price.